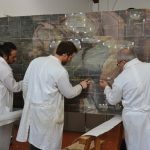 Conservators at the Opificia delle Pietre Dure in Florence at work on the painting. 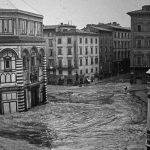 Piazza del Duomo under water, November 4, 1966. Rainfall in the Appenine Mountains of Italy was torrential in the autumn of 1966. On November 3, the waters cascaded into the usually serene Arno River, which divides Florence, and exploded above its banks. Water roared through the medieval city’s narrow streets and broad squares, rising 20 feet above the ground. Over 100 people drowned or were battered to death. Fiats and Vespas floated away. Mud and sewage seeped into every building. Thousands of paintings and sculptures—any artworks on the ground floors of museums and churches—were damaged or destroyed by the worst flood suffered by Florence in four centuries. I was a college student in New York and vividly remember the black-and-gray scenes from the disaster on the grainy television screen in our dormitory’s lobby. And in subsequent days, I was riveted by the frantic efforts of a battalion of volunteers—dubbed “mud angels” by the media—to pull masterpieces out of the floodwaters. This year marks 50 years since the catastrophe. The last of the damaged masterpieces have been restored in time for a commemoration, held in November, of the flood and the city’s heroic response. Some months before the festivities, I visited Florence to get a closer look at the repairs being done to the remaining masterworks and to figure out why in some cases it has taken so long. First stop is the laboratory of the Opificio delle Pietre Dure (Workshop of Semi-Precious Stones), or the OPD, a public institute of the Ministry for Cultural Heritage, that has been in charge of the restoration work. The OPD dates back to the 1500s when, under the patronage of the Medicis, it was famed for fine mosaics and inlaid stonework. Over the last century, the OPD has focused on the conservation and restoration of artworks. So it was natural that it would be asked by the Italian government to assume the leading rescue role after the flood. Besides public subsidies, the OPD has been able to draw on generous contributions from foreign philanthropies, such as the Getty Foundation and the Friends of Florence, among others. The OPD laboratory is located at the Fortezza da Basso, a squat 14th-century fort with daunting gray walls and ramparts. I’m greeted at the entrance by the longtime OPD director, Marco Ciatti, who invites me into a cavernous former storage room. At center stage is Giorgio Vasari’s monumental The Last Supper (1546). The most important remaining artwork still under repair from flood damage, it hung on the ground floor of the Basilica of Santa Croce. During the catastrophe, Vasari’s masterpiece was under water and muck for more than 36 hours. The five panels—altogether over 8 feet high and 21 feet long—sustained two types of damage: the first was to the wood, and the second to the painting, particularly the layer of gesso and animal glue between the artwork and the wood. The water made the panels expand. But it could not be allowed to evaporate too quickly because it would destroy the layers of paint and gesso, and shrink and crack the wood. A decision was made to store the waterlogged masterpiece in a room in which humidity levels were carefully reduced from 90 percent down to nearly zero over the course of two years. Staunching the damage to the painting itself was more complex. Over 20 percent of paint was lost. To hold the remaining colors in place, the painting was covered with a thin layer of adhesive resin. Paper was then placed over the resin. After the two-year, humidity-controlled storage, two further problems arose. Each wood panel had shrunk by almost an inch, which meant that the surface area of the painting was slightly larger than the surface area of the panels. And the resin holding the colors in place had hardened to a glass-like consistency. 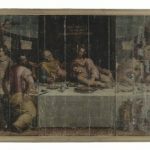 “It took decades to come up with new techniques to restore the paintings over the shrunken panels and to safely remove the resin,” says Ciatti. With funding mainly from the Getty Foundation, graduate students in art, chemistry, and physics were asked to devote their doctoral theses to explore possible solutions. Their research eventually created techniques to stretch the wood back to its original proportions while preserving the paints on its surface. A gel was concocted to dissolve and absorb the resin through the paper overlay without damaging the original colors and gesso. On a scaffolding some eight feet above us, a young woman using an oversized magnifying glass and the thinnest of paintbrushes was applying color to the elbow of a disciple to the left of Jesus. 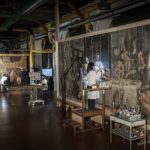 “Our theory of conservation here in Italy is that we don’t want to completely restore the original colors because we believe that retouching must indicate that restoration has taken place,” says Ciatti. To illustrate this, he shows me a panel at ground level that is closest to full restoration. At the bottom of the painting, he points to an urn of water or wine below the table where the Last Supper takes place. Up close, I can see faintly etched lines that mark the restoration spots. The paint has a slightly different pigment than the original. Work at the OPD laboratory isn’t confined to flood-damaged art. Close by the Vasari panels, cleaning and restoration proceeds on masterpieces from Florentine museums, including paintings by Anthony Van Dyck, Annibale Carracci, Fra Angelico—and even Jackson Pollock. But my jaw drops at the sight of Leonardo da Vinci’s Adoration of the Magi, one of the top draws at the Uffizi Gallery. Under restoration here since 2011, it will be returned to the Uffizi in 2016. Nature had nothing to do with the damage to this masterpiece. It was left unfinished by Leonardo when he moved from Florence to Milan in 1481. The painting passed through several owners, finally entering the Medici collection sometime in the 17th century. The Uffizi has owned it since 1670. “Over those many years, a lot of varnish was applied to the painting, probably to hide the fact that it was unfinished and instead pretend it was done in a monochromatic style,” says Ciatti. As evidence he points to the azure and white sky that Leonardo had just begun to paint before abandoning the work; it also was covered by a honey-brown varnish. The OPD lab is in the process of slowly thinning the layer of varnish, though not removing it entirely. “We want the artwork to have the patina of an old painting,” says Ciatti. “This is the traditional Italian philosophy of conservation.” The British approach, by contrast, tends to take the cleaning process further, leaving a newer sheen. Across town from the OPD lab, I pay a visit to the Basilica of Santa Croce where Vasari’s Last Supper will be returned. I am here to see Cimabue’s Crucifix (circa 1288), another masterpiece heavily damaged by the 1966 flood and returned to Santa Croce a decade later. This large tempera-on-wood crucifix (176 by 154 inches) represents a break from the Byzantine style that showed Jesus as aloof, regal and triumphant. He is instead depicted as a suffering, dying man—victim of a fate shared by ordinary mortals. He is the Christ who would become the universal symbol of Christian spirituality. The Cimabue work now hangs much higher than before—some 20 feet above the Basilica floor—to guard against any future cataclysmic flood. Even after the OPD’s efforts, the damage from submersion in the muddy waters a half-century ago left portions of Christ’s face and his thighs discolored. But considering the near obliteration of the paint and the cracking of the wood, it seems a miracle that the masterpiece survived at all. Another near-miraculous event occurs on my walk back to my lodging on a hillside across a bridge over the tranquil Arno. Just as I arrive at the river’s edge, a police convoy slowly drives past, with the Popemobile at its center. I had forgotten that Pope Francis was visiting Florence. In a city of only 362,000 inhabitants, and at the low point of the tourist season, everybody in his path had a front-row view. To my astonishment, I am no more than nine feet away from Francis as he smiles and waves back on his way to deliver a homily at Santa Croce.